Growing up, I was never a big fan of radishes. I did like radish in a stew, when it was cooked until tender and almost sweet. When eaten raw, they are too spicy and peppery for my taste. When I was a kid, I’d always frown when I saw watermelon radishes in my grandma’s shopping basket. Just like other northerners, she’d usually slice the radishes and serve them raw with a plate of salty soy dipping sauce. “It is good for your health.” She’d say. Sometimes I’d grab a piece reluctantly. Most of the time I simply ignored its existence. But once in awhile, she made this pickled radish I love. The Chinese name of this dish is sweet and sour red radish. The method is extremely simple and exactly like its name suggests. 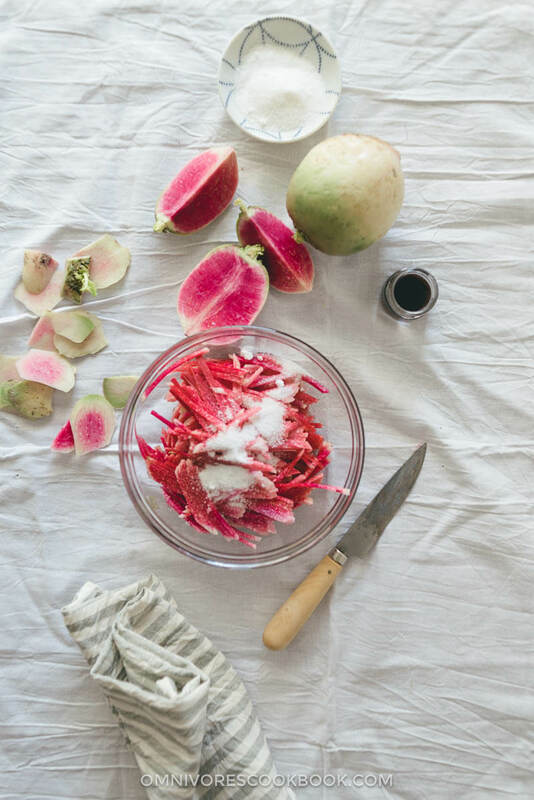 You shred the watermelon radish into thin strips, add plenty of sugar and vinegar, and toss it a few times. Then you let it sit for 5 minutes to soak up the flavor. That’s it! At the end, the radish turns brighter, swimming in a beautiful pink liquid. It tastes sweet with a hint of sour. The peppery flavor will be subdued to a degree that is refreshing but not too spicy. 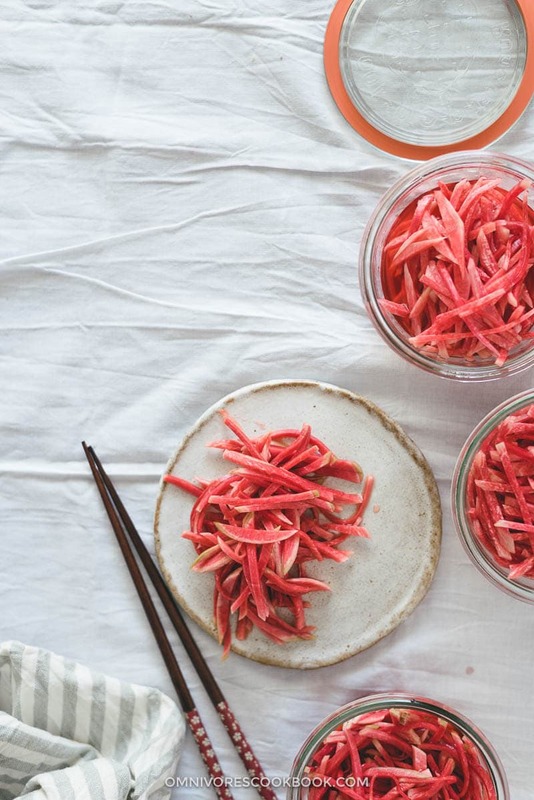 Compared to the savory version, this pickled radish almosts taste like a dessert. I always ate my share of it without complaint. 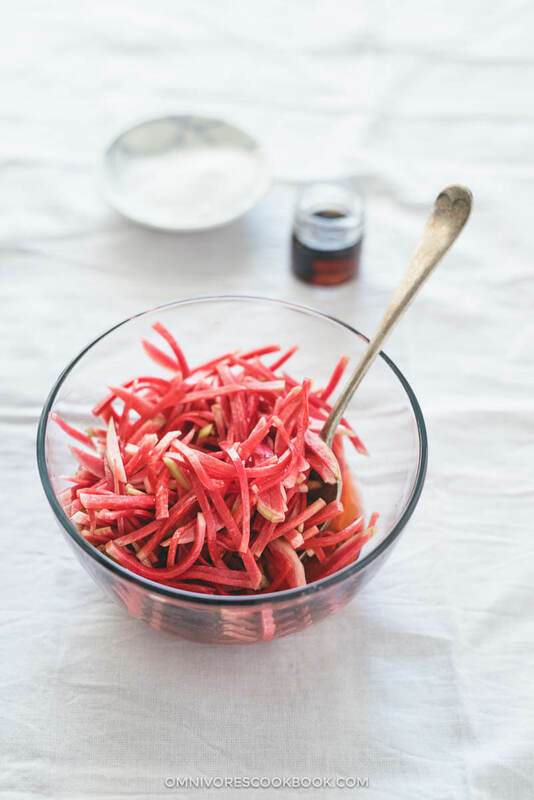 This recipe is still my favorite whenever I cook with watermelon radish. Most of the time I serve it as an appetizer, just like we did in China. My husband loves topping some pickled radish on his rice, like many Asian restaurants do. He says it makes our dinner fancier. 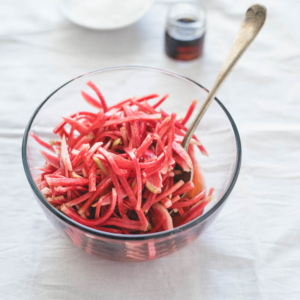 When we’re serving a Western-style dinner, I’ll add the pickled radish into my green salad. You’d be surprised how well it goes with a vinaigrette dressing. This recipe is intended to be served fresh. After all, it takes only 5 minutes to get ready. What I do is use a whole radish and serve half of it for dinner. Then I store the rest of the radish with the brine in the fridge for 1 or 2 days. If you want to store them for a few more days, you should use properly sanitized jars and make more brining liquid, so it covers the radish. 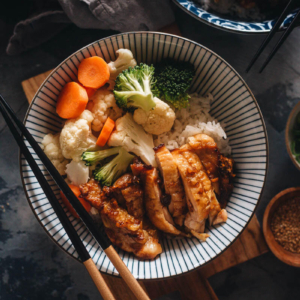 The traditional Chinese method always uses rice vinegar and sugar. But if you prefer a natural sweetener, I recommend the combination of apple cider vinegar and maple syrup. It gives the dish a fruity taste and works just as well as the traditional method. I enjoy processing the radish with a knife. 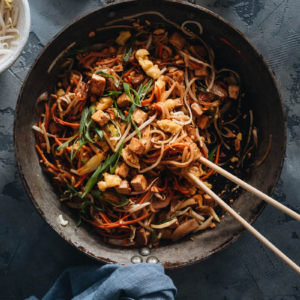 But feel free to use a peeler to shred it, or use a spiralizer to make it into veggie noodles. Combine apple cider vinegar and maple syrup in a large bowl. Mix well. Add radish and toss. Let sit for 10 minutes in the fridge. Add a pinch of salt onto the radish and toss again right before serving. 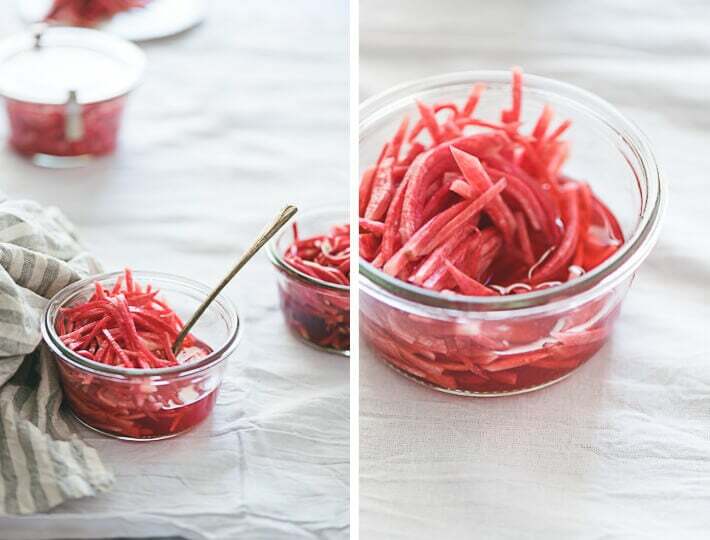 Store the rest of the radish in an airtight jar for up to a week. The nutrition information is an estimate because most of the sugar used in this recipe will be left in the brine. 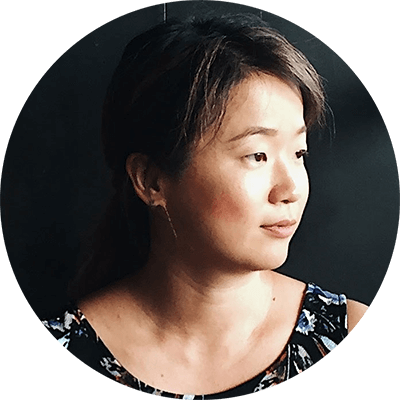 Hi Maggie, I just discovered your beautiful site and am inspired by your approach, attention to detail and depth of information. I greatly appreciate your pantry section too! Less labour intensive works for this Mom 🙂 cheers and congratulations on your efforts. 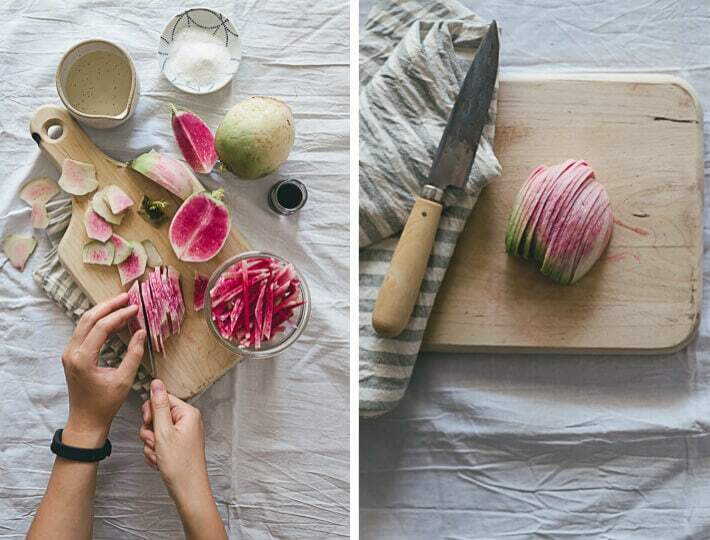 I love the beautiful color of these before and after they’ve been pickled! 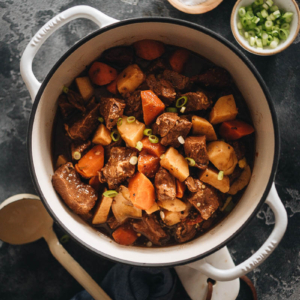 Your pictures are wonderful and do a great job of inviting the reader into wanting to try making the recipe! I definitely know I’m going to give it a try the next time I head to the grocery store. Thank you for sharing!